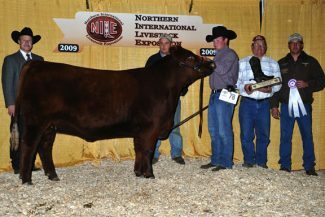 Photo courtesy Browarny Photographics2009 NILE Red Angus Grand Champion Female, Red Six Mile Rebello 483U, owned by Six Mile Red Angus of Fir Mountain, SK. 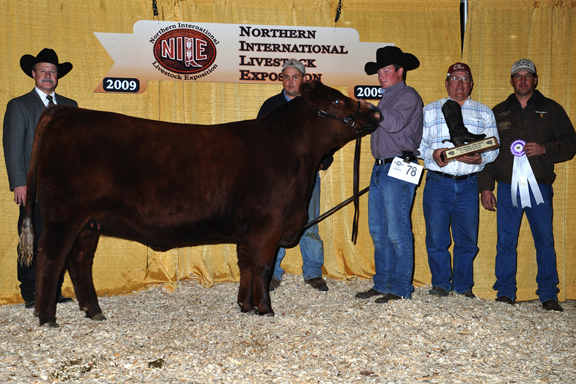 The Northern International Livestock Exposition (NILE) Stock Show hosted the Red Angus show Tuesday, Oct. 13. The judge for the Jr. Red Angus Show was Logan MacLennan of Byers, CO and the open show judge was Alan Sears of Eaton, CO.
Grand Champion Female: Red Six Mile Rebello 483U, sired by YY 4080 Top Gun 614F and consigned Six Mile Red Angus of Fir Mountain, SK. Reserve Champion Female: Red Northline Plush 22U, sired by Red Northline Crush 59R and consigned by Northline Angus of Ardrossan, AB. Grand Champion Bull: Red Lazy MC Cowboy Cut 26U, sired by Red Lazy MC Stout 30S and consigned by Clinton Morasch of Bassano, AB. Reserve Champion Bull: Red Lazy MC Remedy 9U, sired by Red Lazy MC Elixir 54S and consigned by Clinton Morasch of Bassano, AB. Jr. Grand Champion Female: RCRA Belle 882, sired by 4L Ram Canyon 62S and consigned by Cody Kluser of John Day, OR. Jr. Reserve Champion Female: RCRA Foxy 27T, sired by TIE Advantage 4139 and consigned by Cody Kluser of John Day, OR.